India vs New Zealand 3rd T20I: Colin Munro was lucky as he was dropped twice during his breathtaking 40-ball 76 at Seddan Park. India vs New Zealand 3rd T20I: Colin Munro was lucky as he was dropped twice during his breathtaking 40-ball 76 at Seddan Park. It was Hardik Pandya who finally took the catch, safe as a house, to send Munro packing. 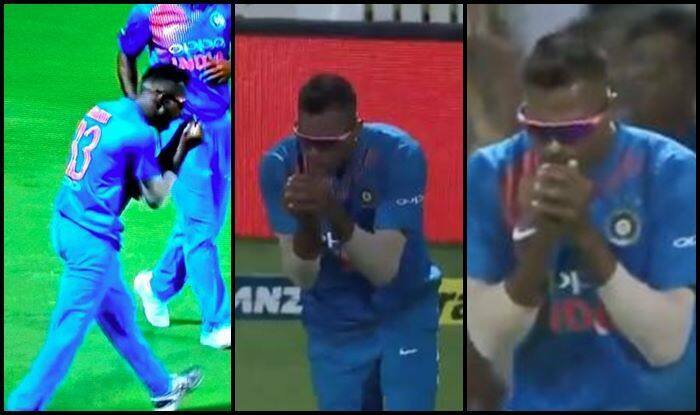 Hardik Pandya was over the moon after taking the catch as he realised the importance of the wicket. Earlier, Khaleel dropped a sitter of Munro. It is a batting paradise at Hamilton and a big total is on the cards, and hence Munro’s wicket could have made a difference of maybe 15-20 runs to the final total. Earlier in the day, Rohit Sharma won the toss and opted to bowl first on a batting paradise at Seddan Park. Kuldeep has been the pick of the bowlers as he scalped two wickets for 26 runs in his stipulated four overs. Meanwhile, the former captain, MS Dhoni is playing his 300th T20, which also makes him the first Indian cricketer to do so. Dhoni is proving his worth behind the stumps and with the bat, which is a big reason for the recent success of India. At the time of filing the copy, the Kiwis were going great guns and were 176/3 in 17 overs.